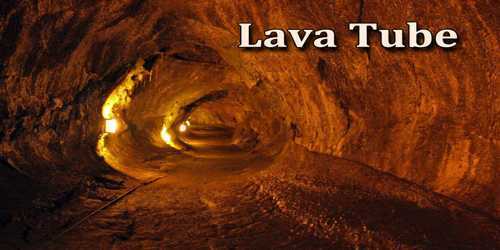 Lava tubes are the longest and most complicated of volcanic caves. They are the channels of rivers of lava that at some earlier time flowed downslope from a volcanic vent or fissure. The size of these tubes is very variable. 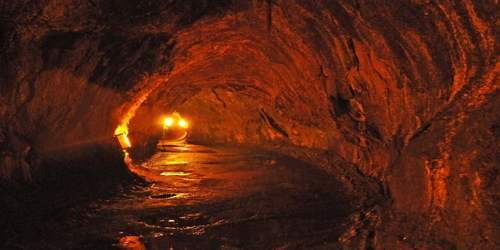 Thus, the Kazumura, in Hawaii, at 59.3 km, is the longest tunnel known on Earth. 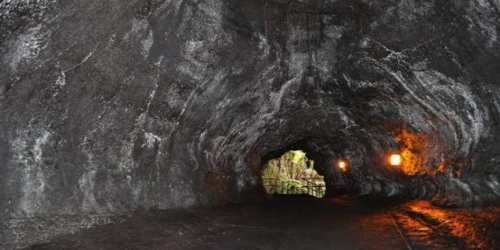 Lava tubes develop best in highly fluid lava, notably a basaltic type known as pahoehoe. The evidence of multiple flows of lava is often evident in the form of layers of flow lines and ledges on the walls formed by successively shallower streams of lava flowing through the tube, sometimes leaving behind hardened lava falls where the magma has flowed down from one layer to the next. At times the river of lava is so hot and fluid that its contents get splashed onto the sides and roof of the tube, creating various types of stalactites, one stranger than the next, as the dripping lava coagulates. The floors of lava tubes tend to be smooth, as is to be expected given the fact that they are essentially the surface of a river that eventually stopped flowing. However, the floors of lava tubes are often times covered with rocks that have crumbled down from the roof of the cave. This happenes almost exclusively during the cooling phase of the lava that surrounds the tube as it cools from the top down resulting in the still flowing – albeit extremely slowly – lava moving at different speeds. Once the lava has fully hardened and the tube is stable it takes a lot to dislodge any part of the roof. This is not to say that lava tubes are immune to the movements of the crust created by, say, a major earthquake. Lava tubes are thus self-forming within a flow field, and like channels they develop downflow during an eruption. Lava tubes are very efficient transporters of lava from the vent to the flow front, and Laszlo Keszthelyi has recently calculated that lava flowing in a tube loses only about 1Cº of heat/kilometer. At the flow front, the lava behaves much like a river delta, forming small distributary tubes that continue to branch until they consist of the same type of single flow-unit tubes (toes) that have been forming the flow the whole way downslope. 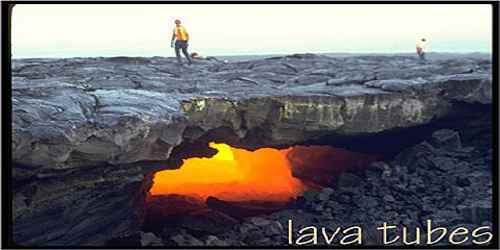 The development of a channel that feeds the advancing front of the lava flow represents the initial stage in the formation of a lava tube.